Roundworms are one of the simplest animal groups that have a complete digestive system. 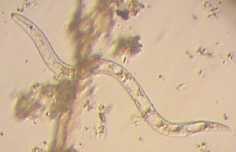 Since roundworms have no respiratory or circulatory systems, they use diffusion for respiration and circulation of substances around their body. Even though they are thin and round, they are actually bilaterally symmetric. Roundworm’s body cavity is a pseudocoel, which lacks the muscle, so that roundworms have to depend on body movement and internal/external pressure to force food down through their digestive tract. Roundworms are surrounded by a strong, flexible noncellular layer called a cuticle. Cuticles made of keratin are secreted by and cover a layer of epidermal cells, which protects the body from drying out, or from other harsh environments. These cuticles don't allow the volume of worm to increase, to keep hydrostatic pressure inside the worm high. Therefore, when the worm grows, it has to molt and form new cuticles. This makes the roundworm unnecessary to possess circular muscles. This hydrostatic pressure is the reason why the roundworms are round. Roundworm eggs can enter the body when we are eating foods or drinking water, touching contaminated soil with open wound , moving unwashed hands that touched contaminated soil to the mouth. When infected by the roundworm, these symptoms happen; irritability, restlessness at night, erratic or poor appetite, constant fatigue, weight loss, abdominal discomfort, diarrhea, fever, coughing, and wheezing. Sometimes, these parasite roundworms can be found in the stool or in bed. Doctors can prescribe drugs that kill the worms. About a week is needed for complete recovery. The medications can't be used to people who are in pregnancy, because medications can harm the baby. Care from a health care professional is needed to completely eradicate the problem. This page was last modified on 12 April 2016, at 15:03.